The term “field trip” can refer to a wide variety of recreational and educational activities. There exist a variety of field trips and a range of benefits that they can provide. Studies have shown that field trips can help strengthen the relationship between cognition, social experience and physical experience. In particular, a study conducted by John H. Falk, Director of the Institute for Learning Innovation at Oregon State University, and Lynn D. Dierkling, professor in the Free-Choice STEM learning program at Oregon State University, found that 96% of 128 subjects interviewed could recall where they went, who they went with, and a number of specific aspects about a childhood field trip (1997). Unfortunately, planning a field trip for people with disabilities can be difficult due to the accommodations necessary for participants. People with disabilities should not be excluded, however, from the benefits of field trips because of their disabilities. The Americans with Disabilities Act of 1990 (ADA), modeled after the Civil Rights Act of 1964, prohibits discrimination against people with disabilities (Introduction to the ADA). Title III of the ADA, in particular, provides a legal basis for what constitutes accessibility in public buildings and accommodations, including basic nondiscrimination requirements as well as many more specific architectural and communication requirements (A Guide to Disability Rights, 2009). However, many buildings still do not meet all ADA specifications, as buildings established before 1990 are only required to show commitment to implement accessibility features in the future. Furthermore, while the ADA provides a helpful baseline for accessibility, there are often other things that must be taken into consideration when planning a trip for people with disabilities. For these reasons, the process of planning community outings for people with disabilities can be very time-consuming. Therefore, the goal of our project was to increase efficiency for employees of the Seven Hills Foundation to identify quality community outings for their participants. To accomplish this, our team members from Worcester Polytechnic Institute’s Worcester Community Project Center, developed a webpage that provides information on potential community outings organized by region and type of venue. Before we could begin identifying and evaluating potential community outings for Seven Hills, we had to first determine important accessibility criteria. We determined this criteria through a series of interviews, focus groups, and discussions with numerous employees, including the Assistive Technology (AT) “Super Users” group, within Seven Hills. As a result of these interviews and focus groups, we found that we should refer to the trips, as stated above, as “community outings” and not “field trips” due to the association of the term field trip with children. Since we are working with an adult population, this was a very significant finding for us. Furthermore, we found that, in addition to venues lacking up-to-date standards due to them being “grandfathered in”, not all important considerations have ADA guidelines, such as sensory accommodations, and that they are equally as important to consider when determining whether or not a venue is accessible. The above findings allowed us to develop an evaluation checklist that we used when evaluating venues in objective 2. This checklist allowed us to keep every venue’s accessibility information organized and consistent. To begin identifying venues to include within the Resource, and to gain more insight into the process of planning community outings, we conducted interviews with employees of organizations serving a similar population to Seven Hills. We conducted phone interviews with the Cotting School, Crystal Springs, and Easter Seals, as well as an in-person group interview with employees of Triangle, Inc. From these interviews, we found that community outings may be organized not only for recreational and educational purposes, but also in order to increase participants’ independence and inclusion within the community. These outings can include taking a participant to do their own shopping, or to community service events. As these outings can help individuals develop life skills and connect them with their community, they are important to provide. Furthermore, we found that pre-planning, particularly calling ahead, is important to the success of a community outing. Through communication at an early stage of the planning process, venues can easily take the time to prepare tours, exhibits or experiences to better fit the visiting population. Finally, we found that communication among employees helps to improve the planning process, and that communication between staff and participants improves the experience for participants. After conducting these interviews, we compiled a list of venues mentioned by the organizations interviewed, as well as many other venues of interest in Central and Eastern Massachusetts, as these are the areas where Seven Hills programs are located. Finally, we began assessing these venues using the aforementioned checklist, doing so in person when possible and otherwise sending the checklist to be filled out by appropriate employees at the venue. These assessments continued throughout the project. To decide which resource would be most effective to suit our project goal, we conducted interviews with Wilson Wong, Computer Science Professor at WPI; Nam Tran Ngoc, the student from Worcester Polytechnic Institute primarily responsible for creating the AT database from 2016; and our sponsor, Steven Kessler. By gathering data from these interviews, we found that Google Sites was the most feasible option to use for the digital resource. Google Sites was free, easy to create, user-friendly and had several key features we wanted such as: search-ability, a section to add comments, and ease of update. To create the webpage, we developed an organizational structure to be utilized throughout the entire web page. 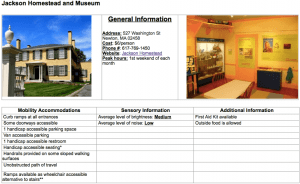 We chose this specific layout by organizing the information from one particular venue, Jackson Homestead and Museum, in three different ways. We then sent the link to the webpage to fifteen employees from Seven Hills Foundation’s Super-User group, asking them to vote on which of the three pages they liked most. The organizational structure that received the most votes, as respondents said that the table format was easiest to read, is shown below in Figure 1. Within each section, a user can easily find all the venues that fit under that specific category sorted by regions in Massachusetts. Once the structure of the webpage was completed, populating it was made easy by copying and pasting each venue’s accessibility accommodation into the table. In conclusion, individuals with disabilities deserve the same opportunities for community inclusion and recreation as all able-bodied people. We hope that the implementation of the webpage into the Seven Hills community will assist them in providing these opportunities for their participants. 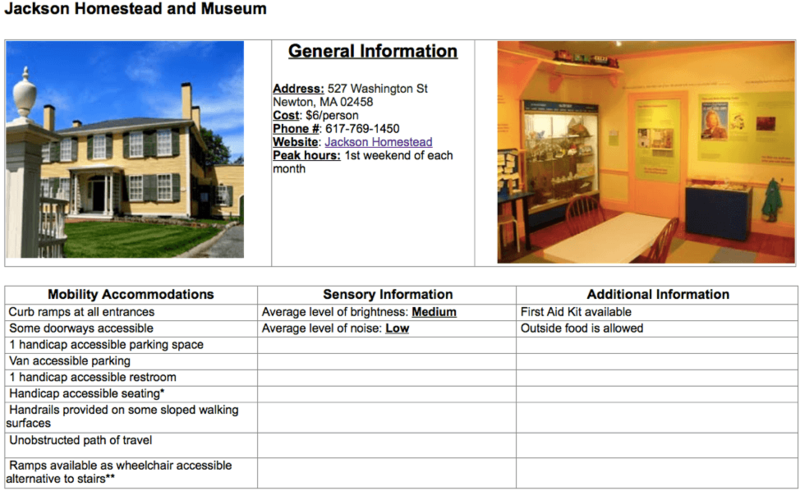 In the future, when new community outings are discovered, the webpage can be easily updated to include the new venue’s accessibility information.